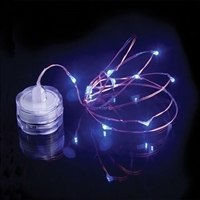 Our catalog offers a variety of string lights for sale at great wholesale prices. With a selection including submersible dew drop lights, leaf lights, paper lantern lights, and more, These lights are perfect for shoppers of all ages looking for an easy way to decorate their home, party or event décor. Lantern lights, string lights, and garland lights create a soothing ambience to any environment. Lights using batteries can be used virtually anywhere with their easily concealable battery packs. Shop a wide selection of string lights with World Buyers today! Whimsical Copper Wire String Lights! Batteries required/Not included. Wonderful Copper Wire String Lights! 50 ft long and with adapter so no batteries required! Perfect for an arbor, an elaborate bride's table, etc. Be imaginative and change the ordinary into extraordinary! Wonderful Copper Wire String Lights! 100 ft long and with adapter so no batteries required! Perfect for an arbor, an elaborate bride's table, etc. Be imaginative and change the ordinary into extraordinary! These "Lavender" lights are actually purple with green leaves, our Bloomination Rose Lights are beautifully handcrafted in Thailand. Each set has 20 Lights with with end-to-end connectors, two extra bulbs and one fuse. This bouquet has a strand of lavender mixed with natural. Clearance price shown now over 55% off. Pink rose with green leaves, our Bloomination Rose Lights are beautifully handcrafted in Thailand. Each light string has 20 Lights with end-to-end connectors, 2 extra bulbs and 1 fuse. Weave through garland or place in a glass vase with pebbles. Each copper wire string has 20 lights, is 6.5' long. 3 AA batteries required not included. Available in warm white, blue and green. There are 3 of each color (except natural) on this Multi-Color Light String. Made from real leaf skeletons, these beautiful light string are handmade in Thailand. Each string has 20 lights with end-to-end connectors, 2 replacements bulbs and 1 fuse. Apprx. 9 ' long. Purple with Lavender amp; Pink base, these Bloomination Light Strings are beautifully handcrafted in Thailand. Each string has 20 lights, with 3.5" flowers (appx), end-to-end connectors, 2 replacement bulbs and 1 replacement fuse. Light String is appx 9 ' long. Color-changing lights can be used with or without water! Weave through garland or place in glass bowl, vase, etc. and fill with pebbles and flowers or your theme! Be creative!! Each wire string has 10 lights, is 36" long. Use two CR2032 3V batteries included. Just in time for 4th of July! These submersible blue lights can be used with or without water! Weave through garland or place in glass bowl, vase, etc. and fill with pebbles and flowers.... add the current holiday theme! Be creative!! 36" long. Use two CR2032 3V batteries included. Dew Drops change the ordinary to something special! Add to any decor for home, event and celebrations. Be creative!! Use two CR2032 3V batteries included. THIS IS THE SAME ITEM AS ROE101 WHICH STILL HAS LARGE QUANTITY. 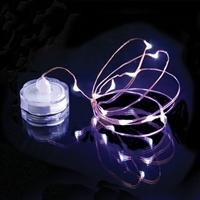 Dew Drops Copper Wire Light Strings Warm White 6' 6hr timer. 3AA Batteries not included. THIS ITEM IS REPLACEMENT FOR AUR012 BUT WITH GREAT NEW PACKAGING! Warm glowing paper lanterns with gold glitter edges. Each string light has 10 led lights and uses an easily concealed battery pack. On/off switch with 8 hour timer. Requires 3 AA Batteries not included.